MediaShow 6 photo and video editing software helps you easily organize, show and share all your photos and videos. Make quick fixes to common photo and video problems with a click. Create impressive slideshows to show friends. Face-tag your photos quickly and efficiently then upload to Facebook! 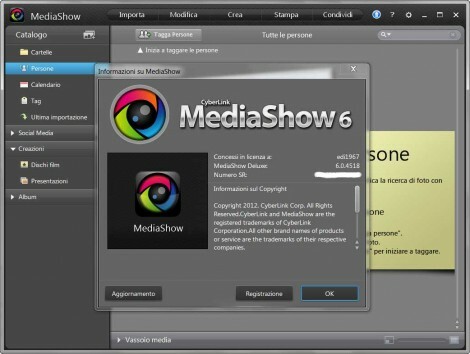 To top it off, MediaShow 5 converts files 10x faster to popular media device formats. CyberLink MediaShow is a fun and easy way to preserve and share the best moments of your life. The one-click fixes, face tagging, uploading to Facebook and express video conversion are just some of the convenient features available for organizing and sharing your photos and videos. 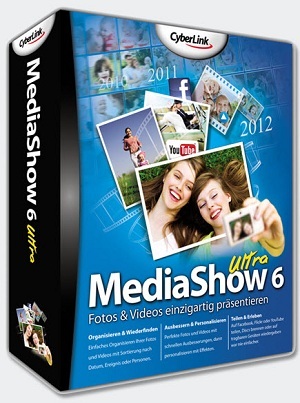 MediaShow provides a range of tools to enhance your photos and videos with one click. Impress your friends by making sure that your photos and videos are always the best look. Explain your adventures through images, combining photos and videos in memorable performances. The new transition effects and text and easy to apply templates allow full production in minutes. CyberLink MediaShow searches and organizes your photo collection using a sophisticated algorithmo face recognition, called FaceMe Technology. This technology groups similar faces and offers intelligent suggestions based on their friends list. It is a quick and easy way to organize your photo collection. automatic grouping of photos plus smart suggestions for tagging make sorting your photos become a quick and easy task. MediaShow automatically organizes your photos and videos by date. MediaShow converts videos 10X faster by optimizing the power of its central processor (CPU) and its graphics processor (GPU). MediaShow is optimized for the technologies of the Family 2010 Intel Core processors, NVIDIA CUDA, and ATI Stream. MediaShow provides easy tools for editing videos. Choose from 12 templates to create a video theme, including music and effects, or trim your clip manually resize video in just a few clicks. Explore new ways to share your memories online. Upload tagged photos directly to Facebook. Add your collection of images on Flickr. Retransm?tase on YouTube. Burn discs of your videos and slideshows to play on your DVD player. Add a navigation menu from built-in library or download heaps of styles from DirectorZone.com. Send your presentations and videos on mobile devices like iPhone, iPod, PSP or Zune. Predefine profiles eliminates the need for complex adjustments.